Home » Specialty Appliances » Knives and Accessories » What is the Best Electric Knife Sharpener on the Market? What is the Best Electric Knife Sharpener on the Market? If you’re not handy with a manual knife sharpener but want to sharpen your kitchen knives whenever they need it, spring for an electric one instead. The job couldn’t be easier or faster and you’ll have razor sharp blades that can slice through a tomato, fillet a fish, or carve a pumpkin in a jiffy. But what is the best electric knife sharpener on the market? Every electric sharpener proceeds through stages of sharpening and depending on the state of your knives’ blades, you may need to use just one or all three or four stages to get a sharp blade. The best knife sharpening system will have 4 stages and therefore 4 pull through slots. However, a maximum of three slots is enough for most home cooks. The first stage of sharpening involves creating a new edge for extremely dull knives. This usually means that some metal is invariably lost here. The second stage involves sharpening the new edge and should ideally not remove any discernible amount of metal. The third stage is a fine sharpening or buffing stage that polishes the blade to make it shiny and like new. The best pull through knife sharpener, whether two stage or three stage, should perform all stages properly without damaging the blade and removing as little metal as possible from it. The slots should be wide enough to fit thick blades but not too wide that blades don’t naturally glide through them at the correct angle as they’re pulled through. Most sharpeners are meant to sharpen at a particular angle, so don’t use Japanese or Asian knives on western knife sharpeners or vice versa. Traditional western knives have a 20° angle blade, while East Asian knives carry a 15°-18° angle. A Wusthof knife comes with a factory angle of 14°. Because the latter kinds are sharper, they tend to go dull more quickly but their performance when they’re sharp are superior to that of American knives. Ensure that you buy the right sharpener for your knives. If you have both kind of knives, we have an option for you that can be adjusted for the two different angles. Now that you know what kind of tool you’ll need, let us help you find a good one with our best electric knife sharpener reviews. Wusthof knives come with a 14° angle(the German standard) and this sharpener is especially good for this particular brand, but will even work on American-style knives as long as you’re OK with changing the angle. Containing 100% diamond-coated abrasive discs – rough and fine, and flexible stropping discs, this electric three–stage sharpener will keep your knives performing like new. It also comes with a three-year warranty and is easy to clean and easy to use. To use the Wusthof Precision Edge Technology sharpener, place the blade in the first slot and slide it towards you, ensuring that the knife passes through twice, once on each side. Do this two to three times to create a new edge. Then, repeat the process on the second slot two more times for both sides to sharpen the new edge. Finally, slide the knife through the third slot for a gleaming finish. You can pull it through the sharpener’s first and third slots up to four times without losing metal. It is not made to sharpen ceramic knives or scissors and has an approximate slot thickness of four millimeters (standard for electric knife sharpeners). It will sharpen serrated knives. The pros of it are it’s fast (only takes a few minutes to sharpen a knife), has accurate, easy to understand directions, and will give new life to your dull knives. The negatives of it are that it may result in scratches to your knives and cause wobble during use. Both these issues are rare and usually caused because the user is not holding the knife correctly. The Chef’sChoice Edgecraft 120 Electric 3-Stage Sharpener offers professional-quality sharpening, using diamond abrasives and stropping, to give you foolproof results that make your knives like new. Also, it comes with a three-year warranty and is less expensive than the Wusthof Sharpener. To use the three-stage system, simply slide the knives through each slot in sequential order. Stage One is to create facets on the knife, particularly if it’s blunt, dull, or damaged. In Stage Two, the sharpening stage, the finer-grit diamond abrasives make a second bevel. During Stage Three, a third micro-bevel is created and the blade is polished to perfection. The bevels are made without shaving off too much metal. This sharpener works on almost any quality knife – chefs’ knives, butcher knives, serrated blades, and sporting knives. This is not for ceramic knives, but can be used for scissors, provided they don’t have wide blades. Made for Western blades, the Chef’sChoice Edgecraft has labeled slots and you have a choice of optimum edges at 15° or 20°. While you can technically use it for Japanese knives, you’re advised to only use them on the third stage, as the other two can damage sharper blades. It works as advertised, requires little skill to operate, and it can sharpen various size blades. However, it comes with few directions and the first stage may scratch the blade. The Trizor Edge creates a triple-beveled edge during the sharpening process. The three-stage EdgeSelect system provides the ultimate versatility and can convert traditional 20° edges into Trizor 15° edges. Namely, with this knife’s traditional, unique spring guards, you can control the sharpening angle. Slide the knife through the Stage One slot, which uses diamond abrasives, to create micro-grooves on the blade. Next, slide it through the Stage Two slot to sharpen it. Then, watch as the stropping mechanisms in Stage Three smooth and polish the knife. 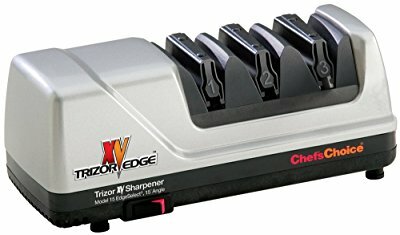 The Chef’sChoice 15 Trizor XV EdgeSelect Electric Knife Sharpener can sharpen Japanese and Western knives (including hunting knives), in addition to straight and serrated blades. It should not be used for paring knives, scissors, or ceramic knives. It gives an ultra-sharp 15° angle, which is perfect for converting traditional 20° knives to a 15° angle. It will also take an 8° or 12° blade to a 15° angle but will need several passes through each stage. The instructions give you detailed instructions for all kinds of knives, and based on customer reviews, this is the best Japanese knife sharpener you can buy. The thickness of the knife slots is standard. This sharpener reshapes the blade, so some metal is shaved off. It will polish the blade so you won’t see any nicks, it works on thin blades, and it’s fast and easy to use. The biggest downside is that you can’t go back to the knife’s original state once it has the Trizor Edge. The Chef’sChoice 1520 AngleSelect Diamond Sharpener is a three-stage sharpener with diamond abrasives that can give the perfect edge to any knife. It’s also one of the most versatile on the market because it can be used for European, American, and Japanese 15° and 20° class knives. How you would use this depends on the style of knife. Asian and Modern European or American styles with a 15° angle can be sharpened using Stage One and Stage Three by simply sliding the knife through the designated slots. To sharpen 20° knives or serrated blades, use Stage Two and Stage Three. This sharpener will provide great edges for kitchen, pocket, hunting/sporting, and serrated knives. It’s not for use with scissors or ceramic knives. It can accommodate thick blades and doesn’t shave off too much metal, making it possibly the best knife sharpening system for most home chefs. It will make your knife look and work like new and it comes with easy to understand instructions. The downsides are that it might leave scratches and creates micro serrations on blade’s edge. This should not be a problem, though, as it will be sharp and you can finish the job fast. The LINKYO Knife Sharpener is a two-stage system sharpener with diamond abrasives, that is simple and safe to use thanks to the no-slip suction cups. It is also fool-proof with a blade positioning guide to keep the knife in its ideal position and comes with a one year warranty. To use, refrain from making a sawing motion when the knife is in the slot. Instead, pull the knife through; it will reshape the blade while sharpening it. For Stage Two, pull the blade through the other slot, again for both sides, to polish and smooth it. This sharpener can be used on Japanese and Western style, if it’s a straight blade. It shouldn’t be used for ceramic knives or scissors. Since it reshapes the blades, it will shave off much metal. The biggest pro of this knife is the automatic stop mechanism that prevents damage when too much downward pressure is placed on the knife. Also, it is very inexpensive. The negatives are that it is a two-stage system instead three and it doesn’t have the versatility or finesse to sharpen many kinds of knives. As long as your goal is to sharpen knives fast at home, this model is the best electric knife sharpener for the money. The two-stage Presto EverSharp Electric Knife Sharpener has rotating disks made of Sapphirite, the grinding material used by professionals. It also comes with a precision blade guide for the best results every time. Stage One will grind and sharpen blades while Stage Two will hone them. Simply pull the blade through the slot, toward you. Be sure to keep it perpendicular to the countertop. Also, keep in the mind that high carbon steel knives may spark when meeting Sapphirite. It is made to sharpen non-serrated knives in alloy, carbon, or stainless steel. Stage Two will sharpen ceramic knives. Do not use to sharpen scissors. You should not use the Presto to sharpen Japanese blades. To be safe, sharpen only Western knives with its preset 20° angle. As with most knife sharpeners, the slots have a thickness of approximately four millimeters. Since it is capable of grinding knives, too much metal may be shaved off. You get noticeable results quickly and it has an automatic stop mechanism for excess pressure. However, it might make your knives asymmetrical. The 20° angle SunrisePro sharpener is one-step and has many unique features, including being eco-friendly and portable. Also, you can sharpen your knives with one hand. To use the SunrisePro, simply pull the knife through the tungsten carbide edges. You should only need to do this three or four times for optimum sharpness. It can be used for virtually anything, be it serrated knives, hunting knives, and bread knives. It is not recommended for use on Japanese knives, scissors, or ceramic knives. This sharpener will only take off micro-bits of metal and won’t reshape your knife. The pluses of this sharpener are that it’s made in the USA, has suction cups to grip onto countertops, and it will extend the life of your knives. However, the sharpener is not long-lasting and knives don’t achieve razor-sharpness.